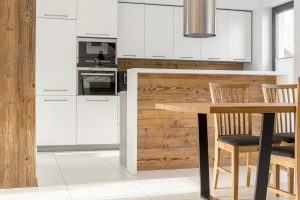 Do You Always Need a New Kitchen to Sell? When you decide to sell, you want to get the best price possible, right? This often means you’ll think about putting in a new kitchen to attract the buyers and their money. However, it’s not always the best move, especially if you’re planning to sell quite soon. A new kitchen will only add £5,000 to £6,000 to your sale price, but you’ll probably spend £12,000 to £15,000 on it. Unless your existing kitchen is a wreck, it may not be worth it. If you plan to stay in the house for another few years, then go right ahead; if you just want a speedier, spendier (ahem) sale, then save your cash. The chances are that your kitchen just needs a bit of TLC and some little touches here and there to bring it up a bit. If you have a few grand to spare and you’re about to sell, then look at the roof, the wiring and the plumbing first. There’s lots of cosmetic touches that’ll make your kitchen look and feel new without gutting the entire pace and spending a fortune. New cupboard doors and countertops are a good bet, as is installing a new oven and dishwasher if your existing ones look tired. Make sure you opt for neutral colours so that no-one is put off by your paisley-patterned resin countertop. You should also make sure that the kitchen doors and windows are in good condition and open and close easily. It’s time too, to look at your cupboard and drawer handles and at the very least make sure they’re not hanging off anymore. Better still, update them. If your kitchen has a wooden floor, then it’s probably worth sanding and resealing it, or if you have tiles, give them a steam cleaning. If you have a carpet in your kitchen, well, the 1980s called and they want you back (this means get rid of it, by the way). You should only attempt DIY that you’re confident with, though. For any jobs that are outside your comfort zone, head straight to the professionals. Most people move because they want more space, so if you’re ripping out your kitchen, why not knock down the wall and create a big kitchen-dining room? Don’t do this if there’s no other reception room, however, or you could seriously reduce your chances of a sale.